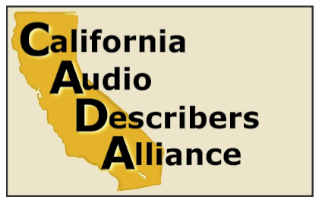 The California Audio Describers Alliance (CADA) is a professional association that was formed in 2006 to help support and advocate standards– based audio description in the Golden State of California. The founding members bring many years of description experience to the service of the alliance. By adopting standards for audio description, the organization joins two schools of description: that of the late Gregory Frazier, professor at San Francisco State University, who developed the concepts underlying description in the 70s and founded AudioVision, and of Margaret and Cody Pfansteihl who, in the 80s, helped develop audio description for the Arena Stage in Washington, DC. Additionally, two founding members participated in the development of video description guidelines. The mission of CADA is to ensure that people who are blind or visually impaired have equal access to cultural and other public events and venues. By embracing a shared set of standards, the members also seek to promote the highest quality description and will strive for greater awareness of the service to both the consumers and cultural venues to increase the opportunities for description. By definition, audio description provides the essential visual information for individuals who are blind or visually impaired using the natural pauses in dialogue or narration to insert detailed descriptions of the essential visual elements: actions, appearance of characters, body language, costumes, settings, lighting, etc., in live productions and filmed or televised broadcasts.